“…Help me Captain; for God’s sake don’t leave me here.” Without stopping, I unfastened the overcoat from around my neck and left it in his death grip, saying I couldn’t help him then, but would send after him as soon as I got across. I pushed on, but the poor fellow’s soul had reached the presence of the Great Commander before I got to the other side." I have always been intrigued by those so-called pivotal moments in history, those events or days that have supposedly forever altered the state of the human condition. In the case of America’s Civil War, we tend to mark the great battles at Antietam, Maryland (September 16-18, 1862) and Gettysburg, Pennsylvania (July 1-3, 1863) as the crucial turning points that would ultimately stem the Southern tide and forever preserve Mr. Lincoln’s cherished Union. While historians will argue the impact and importance of either one of those terrible bloody fights, I tend to side with those that believe that the clash at Antietam truly changed the course of the war. Although General Robert E. Lee’s forces could claim a narrow tactical victory based upon their ability to hold their positions against the savage assaults by Maj. Gen. George B. McClellan’s Army of the Potomac, it was the North that had gained the clear strategic advantage. The battle had successfully repulsed Lee’s first invasion of the North, and it provided Lincoln the impetus to issue the “Emancipation Proclamation.” This executive order that declared slavery abolished in any of the Confederate States that did not return to the Union by January I, 1863, effectively ended any possibility of the South being recognized as a sovereign government or of receiving support from any of the European powers. Vigor, zeal and a fierce dedication to cause would not be enough to overcome the fact that the armies of the Confederacy would remain outgunned, outmanned and outmoded for the remainder of the war. But as one considers the outcome at Antietam, it also important to take into account those lesser known events that would occur just two days after the deadliest day of combat in American history. Even though Lee began the withdrawal of troops back across the Potomac at Boteler’s Ford near Shepherdstown on the evening of September 18th, he was not considering retreat. 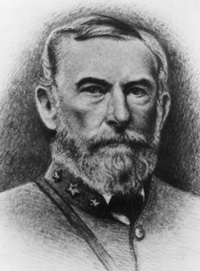 Lee instructed the cavalry under Maj. Gen. James “Jeb” Stuart to secure a ford along the river at Williamsport so that Confederate forces could reenter Maryland and press the campaign in hopes of achieving a decisive victory against the Union Army on Northern soil. Meanwhile, Maj. Gen. William Pendleton, Lee’s chief of artillery, was left to conduct a rearguard action on the Virginia side of the river near Shepherdstown to protect those southern infantry still returning from Antietam. On the afternoon of September 19th, the Southern cannons were challenged by superior Union firepower from north side of the Potomac. By early evening Union infantry were crossing into Virginia, and the rebel’s line of defense was in disarray and near collapse. 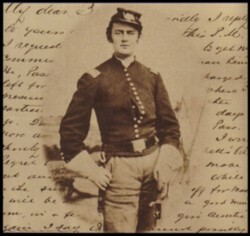 Pendleton, while being exceptional in his role as an artillery officer, had never prior to this point been in direct command of troops that were engaged in battle. His inexperience caused him to panic, and he fled the scene in search of help from command. Around midnight he located General Lee, and he delivered his dire assessment of the situation. Unbeknownst to both men, the southerners had regained their battlefield composure, and had successfully regrouped and staged enough of a defense as to cause the Union troops to withdraw back across the river. Fearing a large scale offensive by McClellan’s army into the already war ravaged Virginia, Lee ordered “Stonewall” Jackson to send A.P. Hill’s division back to Shepherdstown to counter any Northern advance. On September 20th, 1862 the armies of Robert E. Lee and George B. McClellan would square off for the last time. After four hours of fighting, the heavily outnumbered Union forces withdrew back into Maryland. 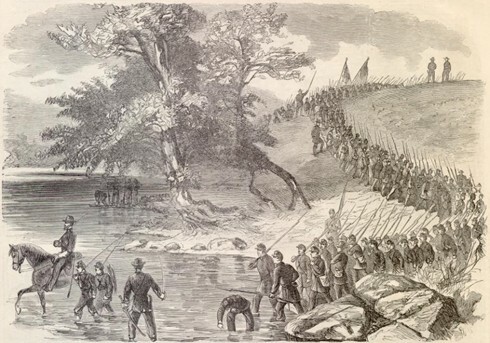 Though a relatively minor skirmish when compared to losses suffered by both sides at Antietam, the Battle of Shepherdstown would drastically alter the course of the war. Lee believing that the North would doggedly pursue his army canceled his plans to re-invade Maryland, and ordered a full scale retreat to more defendable ground further up the Shenandoah Valley. The next time the Army of Northern Virginia would wade into the waters at Boteler’s Ford with the intent of defeating the Yankees on their own turf the landscape would be very much changed. George Meade would now be in command of the Army of the Potomac, and the community of Shepherdstown would be part of the newly formed state of West Virginia, which was admitted to the Union on June 20th, 1863. This area that had formerly been the western part of Virginia sent over 30,000 of her sons to serve the Northern cause, and another nearly 20,000 would fill out the ranks of Confederacy. West Virginia, as much as any state during the war, epitomized this struggle of “Brother against brother.” Today the people of the Mountain State continue to reflect upon those divisions of the past—and in many ways those differences have once again become part of the greater national debate. 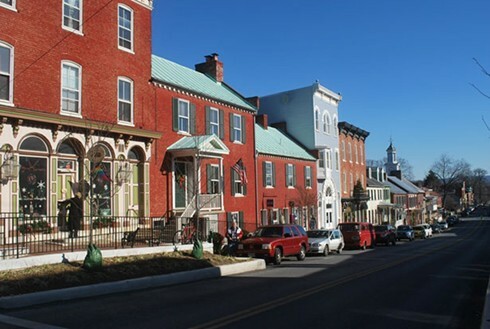 And while there seems to be a level of anger and antagonism similar to what was expressed throughout America during the civil discord of the nineteenth century, at least in the community of Shepherdstown a more gracious and accommodating manner prevails. Here there is a shared reverence for the past, and at the same time a respectful attitude about the present. 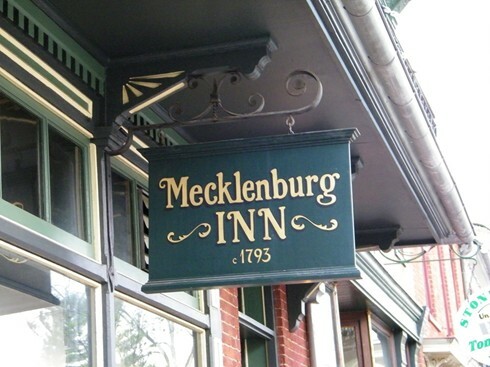 And nowhere in the town is this better demonstrated than at O’Hurley’s General Store or that bastion of southern congeniality, the Mecklenburg Inn. For the last thirty years a group of resident pickers and players has gathered at the general store after closing to entertain visitors with traditional, Celtic and contemporary tunes. 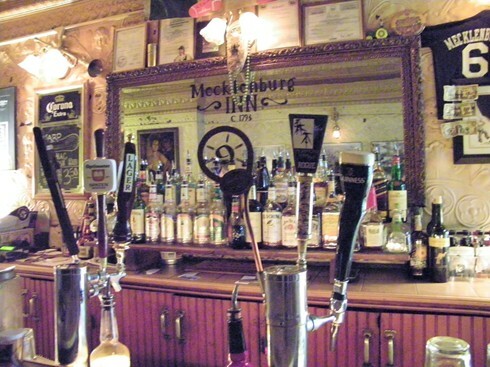 The Mecklenburg Inn also features music with the added advantage of strong liquor and good beer. When we visited “The Meck,” as the locals like to call it, we were regaled with an impromptu a cappella rendition of “The Patriot Game" by State Delegate John Doyle. Scenes like this at the pub are not all that unusual, because the Mecklenburg Innis a place filled with character and characters. My favorite one being, with my apologies to that fine Irish crooner and servant of the people, John Doyle, B.K. (Bar Kitty), an orange tabby with an amputated tail that wandered in one day and never left. 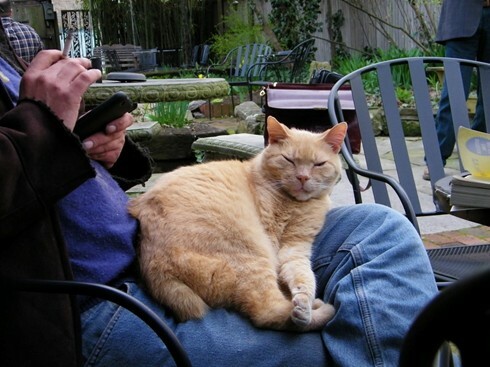 When not curled up on some patron’s lap, this attentive feline provides security and often acts as tour guide, as was the case during my exploration of the establishment. The front taproom is dimly lit and finished with dark woods, and ornate tin covers the walls and ceiling. 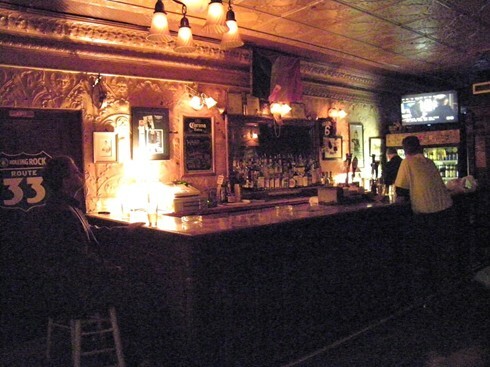 Just beyond the bar there is an inviting game room with a wood burning stove. 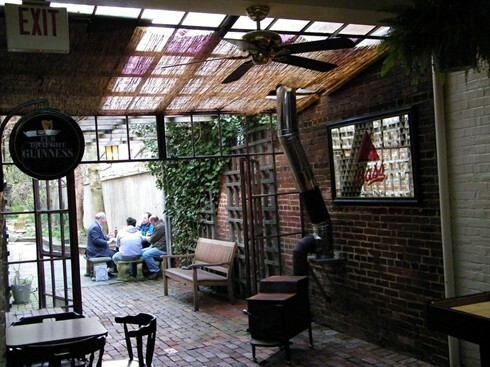 And for those more temperate afternoons and evenings there is a courtyard and beer garden out back. As one takes in the charm and pleasant ambiance of this Federal-style brick building, it’s hard to imagine that it served as a makeshift Confederate hospital after the battle at Antietam. Those same snug corners that once sheltered the wounded and dieing are now occupied by artists, musicians, college students, professionals, politicians, tradesmen and tourists. But in the midst of the current day revelry there is still a sense of the debt and respect that we owe to those that had been at this place before us. "I am a Southerner by birth and a Rebel by choice. As I read and study, I pull for Lee, Jackson and Longstreet. As I live, I thank Grant, Lincoln, and Democracy." While so many Americas have become embittered about the present state of affairs, and once more we seem to be living in a house divided, at least on this piece of ground in Shepherdstown, West Virginia—I stand with decent and honorable people in a public house united. American Public House Review would like to congratulate John Doyle for his re-elction to the West Virginia House of Delegates. The Mech has no website.